Scale and proportion are two design elements that help to create the atmosphere within a room. It’s important for everything from the kitchen cabinets to the wall art to fit together properly and that is where scale and proportion comes into play when creating interior design. Scale refers to how the items within the room relate to each other or to the room itself. Proportion is similar to scale but it refers to the shape and dimensions of the objects within a room and it’s all about visual perception. When you place an oversized dining room table in your den, leaving little room for anything else, this would be an example of something being out of scale. Placing a small, low-sitting sofa in a large living room with a high ceiling is another example. In order to achieve proper scale, you have to choose furnishings to match the space around them. You have the option of customizing your home if someone in your family is extra short or tall. For example, if the cook in the family is very short, then you can customize your cabinets and make them lower than normal to make it easier for them to reach everything. If the man of the house is extra tall, you can install a higher than normal showerhead in the bathroom. You determine what scale fits your needs the best based on the individuals living in the home. Placing a large TV on a small stand is an example of something being out of proportion because it would appear unbalanced when you look at it. You may even feel like it will topple over when you see it, which creates an uneasy feeling. When objects are proportioned correctly, everything will seem balanced and pleasing to look at and you will feel relaxed and comfortable. Creating proportion with your interior design is different for every structure, which is why many people rely on professional interior designers and decorators to help them achieve the look they want. When you’re ready to start your next project give us a call here at J. 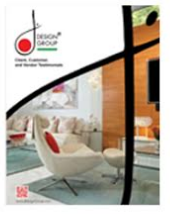 Design Group and we’ll help you achieve proper scale and proportion within your interior design. When creating scale and proportion with interior design, color plays as much of a role as size does. You can create illusions that make the room look larger or smaller simply by the color you use. For example, painting the ceiling white and the walls a light color or using wallpaper with vertical stripes will make small rooms with low ceilings appear larger. Decorating with simple patterns and small designs will also help make the room look bigger. Painting the ceiling a darker color than the walls will help make large rooms with high ceilings look smaller. You can use bold patterns and lots of accessories to fill up the room to make it feel more cozy and comfortable. When these two design elements are integrated correctly into the interior design, you’ll create a warm and welcoming environment. However, when the items in the room are too small or too large for the space, it can make the room feel cold and uncomfortable.